Pandora’s Sound Box is an interactive multimedia exhibition conceived to destabilize and reactivate our vision of the current global political landscape through performance, sound, video and site-specific installations. The exhibition demonstrates a kind of experiment of the associative imagination by which the viewer may explore other dimensions of experience while simultaneously becoming a performer. The title of the exhibition was inspired by Georg Wilhelm Pabst’s controversial 1929 film Pandora’s Box, which exposed and explored the fear of female sexuality. Although considered thirty years ahead of its time, Pandora’s Box was banned by Hitler upon its release and classified as “degenerateart.” Pandora’s Sound Box deals with the identification of fearing contemporary society, i.e. fear of war, terrorism, immigration, and the media, as conveyed through the strong material presence of sound. The exhibition in the main gallery space features work by Pierre Bismuth, Agnieszka Kurant, Matthieu Laurette, Oswaldo Macia, and Carlo Zanni. WHITE BOX PROJECTS space will feature special changing installations by Django Hernández, Davide Bertocchi, Robert Lazzarini and Olaf Breuning. Special performances by Michaël Aerts and Vadim Vosters, as well as Tanja Ostojic will take place as part of the exhibition. Pierre Bismuth’s The Bruce Nauman Project is a new installation, which draws a futurist scenario of the fate of art. Following the legacy of the avant-gardes whose artistic research was profoundly anchored in the exaltation of modern life, The Bruce Nauman Project captures the present in its most contemporary forms and transforms it into a blueprint for the future. Davide Bertocchi’s Exhaust (2009) is a montage of several short You Tube video extracts taken from amateur videos recording sound tests of car exhaust pipes. These cars are shot as they are without tuning. Amongst the footage of the car exhaust pipes, the artist includes a model called “Bertocchi Mufflers”. This pseudo-biographical element is revealed through a completely useless and self-referential action, which is a recurring aspect of the artist’s work. The roar of an engine, as a polluting and rather expensive action, refers to the dissipation of energy and to its existential dimension. 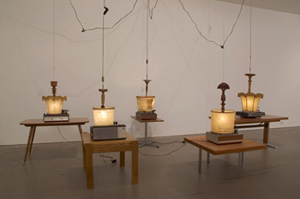 Django Hernández’ President’s Secrets (2006) incorporates found record players, coffee tables and lamps with recorded texts and sound. Upside down lamps project transcriptions of secret presidential phone conversations. Agnieszka Kurant’s Future Anterior (2008) is a print of eight pages of the New York Times in the year 2020, as predicted by a professional clairvoyant who collaborates regularly with Interpol, police and governments. Her forecasts are developed into an issue of the New York Times with articles written by NYT journalists and other ghostwriters. In reproducing the exact parameters of the New York Times from a bar code to advertisements, it is printed with disappearing heat-sensitive paint, which becomes completely invisible above 18° C and returns to black when it is cooled down. As a result the newspaper appears and disappears depending on the weather conditions, the temperature of the room or the warming touch of human hands. Since his first Apparition on Tournez Manége (1993), Matthieu Laurette has been developing an ongoing series of what he calls ‘Apparitions’ on TV and in the media. (In French, the word apparition means both ‘apparition’ and ‘appearance’). On the occasion of Pandora’s Sound Box, Laurette will develop a new performative series of Apparitions, which airs on various American national TV channels from October 27 through November 1st, and thereafter will run continuously on the Video Box monitor displayed within White Box’s exterior window. For the opening on November 2nd , Matthieu Laurette will conceive a site-specific related performative event. Oswaldo Macia’s sound installation Darfur (2006) evokes a proverb from the Darfur region: “The dog barks, but it makes no difference to the camel – we are the dogs, the world is the camel.” Arranged in 12 channels, the piece is composed by a selection of two hundred different barking and yelping recordings made in a Cagliari compound of abandoned mongrel dogs. The analogy between the Darfur proverb, the abandoned Cagliari mongrel dogs, and the deaf camel brings out a poignant sense of harsh severity, illustrating a world that refuses to listen or to act against the suffering of others. Tanja Ostojic’s delegated performance Misplaced Woman portrays activities from everyday life, signifying a displacement common among transients, migrants and disaster refugees as well as to the itinerant artist traveling the world to earn her living. Michaël Aerts and Vadim Vosters perform Refence, a fencing confrontation between the artists, claiming a new position in the art of fencing between fencing as a sport, theater fencing, spectacle fencing and modern academic fencing known as mensur. The performance examines the boundaries of four work related values/dichotomies in our society (power/distance, uncertainty/avoidance, masculinity / femininity and individualism / collectivism). The artists are masked in their nonverbal confrontation, resulting in a kind of visual dance. Carlo Zanni’s The Fifth Day is the second installment of a trilogy inspired by the Three Days of the Condor by Sidney Pollack. This work is a sequence of ten networked pictures depicting a taxi ride in Alexandria, Egypt. Rats is a new work by artist Robert Lazzarini. The installation presents us with a sparsely lit quasi-apartment space. Referencing one of the most common phobias, musophobia (fear of mice and rats), Rats situates itself between formal mediation and physical response. It combines stereotypical notions of rats -disease, plague, fear -with perceptual dislocation. For the last week of Pandora’s Sound Box, White Box is pleased to host an exclusive impromptu event by Olaf Breuning in WHITE BOX PROJECTS space. This exhibition has been made possible through the generous support of Deweer Gallery, Galerie Pamme-Vogelsang, Galeria Fortes Vilaça, Alexander Bonin Gallery, Frederico Luger, Premio Terna, COMA and Cultural Services of the French Embassy. Special thanks to Assistant Curator Julija Cistiakova, Jee Won Kim and Tae Hyung Park of Jee Won Kim Architect / GI Design Studio. WHITE BOX is a 501 [c] (3) not-for-profit arts organization. Your donations are tax-deductible to the maximum extent permitted by law. Annual exhibition support provided in part by the New York City Department of Cultural Affairs, the Andy Warhol Foundation for the Visual Arts, and the Rockefeller Brothers Fund.